Home :: Exhaust :: CR125 Exhaust :: CR125 Silencers & Accessories :: M4 125cc Shifter Silencer (1.0" Inlet, 14" Length) - Tunable! - Overstock sale! 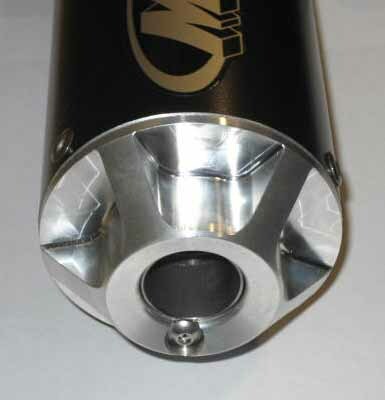 M4 125cc Shifter Silencer (1.0" Inlet, 14" Length) - Tunable! - Overstock sale! This is the latest and greatest from M4. Fully tunable 3x14" silencer with FIVE tunable inserts to adjust back pressure. Redesigned inlet and outlet for improved durability. Hi-Tech Continuous Roving Packing Material. Perfect for Stock or Modified Moto engines. Fits the RLV R4/R5 & RCE T3 pipes. Required at Infineon Kart track. Tuning Inserts Included: 0.75", 0.83", 0.87", 0.9", 0.925"
Only available with 1.0" inlet. Tunable Outlet. Simply remove the lock screw to replace the tuning inserts.